Depending upon which map of which era, the small creek which empties into Thompson Run has had several names -- or just a series of typos. The earliest sources, including the 1907 USGS map and the builder plaque on a nearby county bridge from 1916, show the name as "Lake Run." One later map shows "Lick Run." Most newer maps, including the current USGS map, call the stream "Leak Run." Thompson Run flows south in its deep wide valley dividing Wilkins Twp from Monroeville (Patton Twp until 1951). As an extension of the Turtle Creek Valley, it was something of a barrier to travel with few easy locations to cross east-west. About one-half mile south, c1810, Northern Turnpike had forsaken an easy western approach to cross Thompson Run but took advantage of a narrow ravine to climb eastward into Wilkins Twp and on to Pittsburgh. At Lake Run was one of the few breaks in the eastern wall. Following Lake Run was a convenient location for an east-west travel into Patton Twp. Lake Run Road, shown on maps of the mid-1800s, would become part of Old William Penn Highway in 1924. This portion of the railroad was built by the Pittsburgh, Bessemer and Lake Erie Railroad. It opened in 1897 with the completion of the high bridge over the Allegheny River in Harmar (replaced 1918). Once the main line had been established many of the original structures were replaced in the twenty years which followed. The structure which carries the railroad over Leak Run was completed in 1902. The portion of the rail line from North Bessemer in Penn Hills to East Pittsburgh was leased in 1906 and later sold to the Union Railroad. At the north end of the structure, a spur descended the northern wall of the Lake Run valley and continued westward into Patton Twp. Crossing land owned by Carothers and Beatty, the mine railroad followed the creek to present-day Duff Rd. 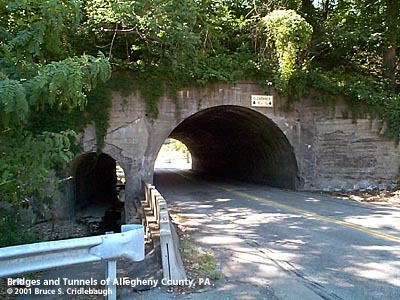 The line ascended a ravine which has since been regraded and filled by homes and William Penn Hwy in the 1940s. The railroad crossed US22 near Wendy's, passed below Center Rd on a trestle and split to serve various strip mines. The largest area was McMasters Grove, a local favorite for picnics. When the mines were opened to supply the needs of the First World War, the Grove was destroyed. Caruso Plan and Giant Eagle on Monroeville Blvd were also built on mined land. In 1953, the former strip mined land which had been McMasters Grove became Monroeville's first major shopping plaza, the Miracle Mile. At the junction of the mine spur and the B&LE was one of Monroeville's first gas stations. The Gravity Fill was served by a tank car parked on the spur above Old William Penn Highway.